There are some things that are a given when it comes to making a film better and one of those things just so happens to be Christopher Lee. Add to the mix Terence Fisher, a Hammer mainstay director and the legendary Richard Matheson on script duties, and you have a fantastic combination to create movie magic. Also adding to the fact that the film plays to Lee’s strengths with a leading character that is strong and dynamic, and the movie itself was one he championed to be made from the book by Dennis Wheately, and on the surface, everything seems to lead up to a win. But after viewing the picture, does this indeed equal a winning formula, does it keep you interested enough to sit through more than the first twenty minutes? The answer is an obvious yes, for how could it not be with all of these things factoring into the film. It may not have the gothic romance of Dracula or the madness of Frankenstein, but it is a true horror classic that demands attention. The movie sees the Duc de Richleau welcoming his friend Rex Van Ryn who has come for a visit and soon, they then in turn seek out another companion, Simon Aron. Finding Simon at his residence involved in what seems to be black magic, Richleau is obviously worried and so they get Simon out of there, unwillingly of course. What follows is a battle between good and evil, life and death as Richleau and his friends fight off the satanic cult headed up by the menacing Mocata. Christopher Lee puts in his usual good performance, which is often better than most, but unlike other roles he has had, his character in this film is very matter-of-fact. The Duc de Richleau for much of the first half of the film states things as they are, declaring everything as truth with his statements with no room for disagreement. It is quite engaging to see him do so as if Richleau has encountered black magic and Satanists before. He automatically knows what to do, how and why and he will brook no argument about it. Some of this can obviously be attributed to Richard Matheson’s wonderful script, but it is Lee whose presence demands attention from both his peers onscreen as well as from the viewer. During the latter part of the movie, he tends to loosen up a bit as things get more chaotic and out of his control, but he still commands, even from an apparent losing position. What made this role even more interesting was the fact that Christopher Lee played a man on the side of good, after having played various villains for so long. It was not often you would see Lee as the lead protagonist, but when you did, you could see that he was quite the versatile actor when he needed to be. On the opposite side of the fence, Charles Gray is truly scary as Mocata, the movies antagonist, main villain and servant of Satan. He is very suave in his villainy and he revels in it as if it were a new toy for him to play with. He strikes a more unassuming figure than Lee does and you would never peg the man for a villain if you met him in the street, but when he shows his true colours, his presence is imposing and leaves you quaking. Even Richleau backs down a little from Mocata, knowing that before him stands a man of power, though in the end he does get the better of him. Unlike Richleau, Mocata has many powers at his disposal and is not afraid to use them. Often, he does so to torment the heroes of the film so that he might gain Simon back to complete his circle. The man will go to any length to succeed whether it is summoning the Goat of Mendes, the Angel of Death or even sacrificing a child. Facing a man that is willing to do anything, magic user or cult leader aside, can be an intimidating experience. Terence Fisher, the man responsible for directing many of Hammer’s classic horror films also lent his magic to this movie. Here, his direction was more subtle and even possibly more skilled in its efforts as there was no larger than life monster or creature to focus upon, though Lee would still steal the show. 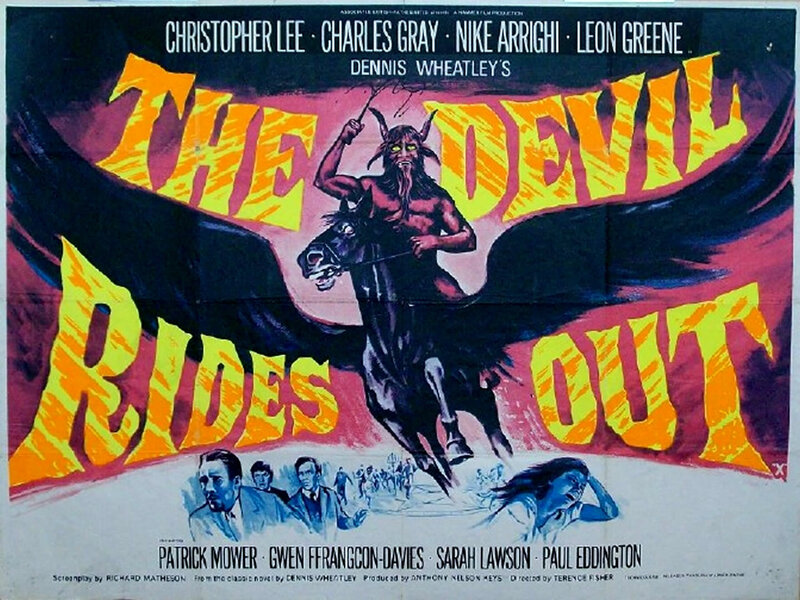 While Fisher would rise to fame directing various Mummy and Frankenstein pictures for the studio, The Devil Rides Out stands as one of his best, if not the best film he ever made. Coupling that expert direction with some great actors, among them the aforementioned Lee and Gray, as well as Niké Arrighi, Leon Greene and Patrick Mower, an amazing script by The Legend of Hell House’s Richard Matheson and some very decent special effects, The Devil Rides out is a masterpiece of classic British horror. This looks bloody brilliant on paper! Satanic cults are a rarity in horror….the focus is always more on the demon side of things. I think you would really like it. Has some really good effects for the time too, so evades that cheesy look. A fine write-up of 1 of Lee’s finest films. An extraordinary man w exceptional talents – 1 of th greats to b sure. We will never see his like in movies again. He was a great man and this one of his best films.